The first reaction to this column headline is going to be: is she crazy? But people of a certain vintage would immediately recognise that it is a take-off on the 1964 Stanley Kubrick film Dr. Strangelove or: How I Learned to Stop Worrying and Love the Bomb. Younger film buffs may also smile in understanding. That is, if they are familiar with this classic black comedy in which the world faces nuclear destruction from the antics of a mad US general, Jack D. Ripper, who, terrified that the Russians are after American drinking water, triggers a catastrophic missile attack. To an earlier generation, Kubrick’s scary-funny film was a terrifying observation on the nuclear issue: those charged with protecting the world are not really the best people for the job. As the Fukushima nuclear catastrophe in Japan began unfolding in slow motion last month, it was flashback time to Dr Strangelove as the nuclear lobby went into overdrive to reassure the world that reactor burnouts in Fukushima were nothing to be afraid of. Absurdity has been reaching a high pitch as scientists come out with dismissive explanations to counter what they call scare-mongering by a nuclear-illiterate media. “Purely a chemical reaction and not a nuclear emergency,” is possibly the most comforting comment we have heard since March 11, when the first of six reactors at the Tokyo Electric Power Company’s Daiichi power plant in Fukushima began leaking radiation. That comes from the man who heads our nuclear establishment, Srikumar Banerjee, chairperson of the Atomic Energy Commission. “Once the plant shuts down after an emergency situation automatically, the fission reaction stops and it is only the residual heat that has to be quenched and that is what the Japanese are doing,” he said in a widely circulated statement three days after the disaster began. Not to be outdone, S K Jain, the boss of the Nuclear Power Corporation of India, was confident that there was no nuclear accident or even incident in Fukushima. “It is a well planned emergency preparedness programme which the nuclear operators of Tepco are carrying out to contain the residual heat after the plants had an automatic shutdown following a major earthquake.” It is this company which runs India’s 20 nuclear projects, one of which has been shut down. Perhaps, they had been precipitate? One would like to find excuses for nonchalance since these are men in whom our nuclear safety lies. Even if the Fukushima explosions were chemical reactions, surely there were serious implications since they occurred in a nuclear facility? More so since it was a facility where spent fuel rods were being kept in tanks close by and where the fire ultimately spread? Incidentally, a just-released report by US National Institutes of Health finds that the risk of thyroid cancer among people exposed as children to the nuclear fallout at Chernobyl has not declined nearly 25 years after the disaster. And should someone remind Lovelock that the current crisis is taking place in the technological wonderland of Japan whose scientists are nothing short of geniuses? So you’re curious why the Nuclear Regulatory Commission (NRC) of the US is being more circumspect about Fukushima and why the International Atomic Energy Agency, too, is worried about radiation from the site. You also wonder why the Nuclear and Industrial Safety Agency of Japan has suddenly instructed Tepco to review the radiation control system at Daiichi. That is after 17 workers received over 100 millisieverts of radiation. What is the safe dose? NRC says it is 1 millisieverts a year but who is to tell? If the scientists are right that thyroid cancers were high in the former Soviet Union after Chernobyl because Central Asians are deficient in iodine, you wonder why the Japanese authorities are so concerned. Why are they warning people about the radiation risk in milk, water and vegetables found to contain high amounts of iodine-131 and cesium-137? So why worry about Fukushima when Chavara in Kerala has higher background radiation? After all, people living there have radionucleides in their body that are 10-20 times greater and still lead healthier lives than the rest of us. 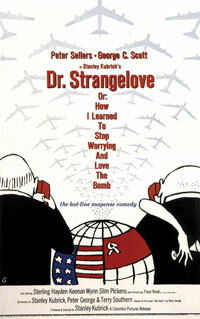 I don’t miss you, Dr Strangelove. Latha - what a good read - this is a knife dipped in honey! Have to say my interest was piqued by the title of the article, and if the issue you paint was not about life, death and disease, it would be funny -the utterly foolish statements of the nuclear experts. The most one can hope is that they don't actually believe what they are saying (or having to say to keep their jobs). A wonderful critical delivery of the catastrophe in Japan and it's unfolding. I would just like to add that besides the task being in "bad hands" and the propaganda machine that accompanies it, what makes me fearful about the nuclear industry is the inherent risk associated with it, and one's that risk is embraced, Dr. Strangelove will just become incidental to it's proliferation and outcomes.